Way up yonder between Mars and Jupiter is the asteroid named Demeter — oh, sorry, that's the Greek version. The asteroid is Ceres, named after the Roman god of agriculture. That must explain the wheat and corn fields on it. Actually, it was large enough to be considered a planet from 1801 when Giuseppe Piazzi discovered it, and reclassified as an asteroid in the 1850s. A passel of asteroids have names, but Ceres is the most impressive. Occator Crater on Ceres in false colors. Another impressive feature is the way Ceres causes serious consternation for secular astronomers. Yet again, cosmic evolutionary expectations are not met, and scientists receive surprises — surprises that indicate a recently-created universe. I reckon the dwarf planet makes them grumpy, and not happy, Doc. 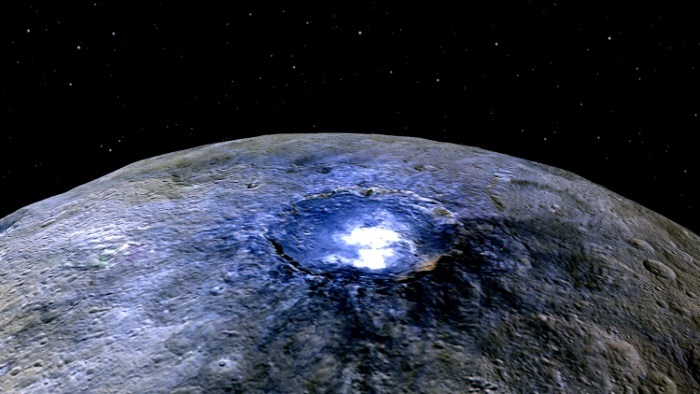 You can read about the surprising salt, bright spots, DAWN spacecraft, and how Ceres is upsetting evolutionary cosmology. Don't be bashful, click on "Want Salt on Your Ceres?"